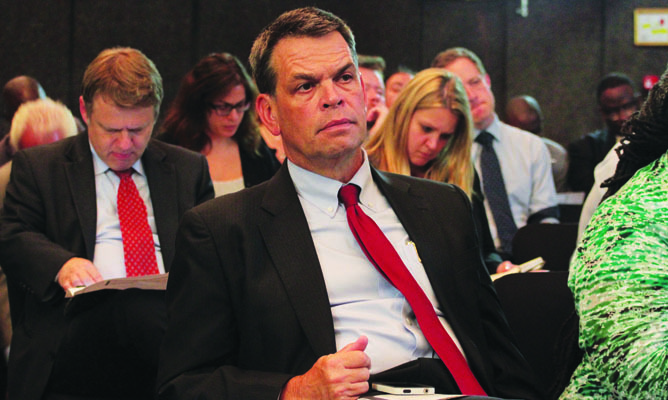 ZIMBABWE – President Robert Mugabe must learn to follow the law on electoral issues although polls are never perfect, outgoing United States ambassador to Zimbabwe Bruce Wharton has said. In a farewell discussion in which he answered questions from ordinary people and the youth in Harare, Wharton urged government to shift its focus from sanctions to the economy. Mugabe and some members of his inner circle were slapped with targetted sanctions on allegations of human rights abuses. “No election is perfect. But we need the Electoral Act here to be followed. The 2013 election was peaceful, that is a big step in the right direction. Elections have been a problem both in Zimbabwe and in the US, for example, the Florida elections. The US government believes the 2013 elections were not credible. Even [Patrick]Chinamasa [Finance minister] admitted that the economic meltdown in Zimbabwe is bigger than sanctions,” Wharton said. He dismissed claims that the US sanctions have constrained the country’s economic recovery arguing that the meltdown was never a result of sanctions and that America continues to trade with Zimbabwe. “Sanctions are not the reason Zimbabwe’s economy is performing badly, but rather bad or inconsistent policy decisions by the government. Sanctions are not the problem; no correlation to economic growth,” Wharton said. He added that between 2008 and 2010, the economy grew significantly despite the sanctions mantra. “OPIC [the Overseas Private Investment Corporation, the US government’s development finance institution] has underwritten a $200 million investment in BancABC. Bilateral trade between Zimbabwe and the US is $160 million in favour of Zimbabwe. This is still small, but has been growing. “There is no prohibition on Zimbabwean farmers exporting to the US, but there is need for a drive to open the markets. Zimbabwean farmers need to focus first on producing enough for the local market before they focus on international markets,” he said. Wharton called for respect of democratic rights including freedom of speech. “Freedom from being abducted is a human right. Land and property law needs to be upheld because without these no one will invest. Respect for human rights, to speak freely without concern of retribution, [is important],” he said. With continued reports of the conflation of the ruling Zanu PF party and government, Wharton said it was vital that there is clear separation of powers. “A strong Parliament is a way of ensuring separation of powers and conflict between ruling party and the government. “How Zimbabweans manage their society is something only Zimbabweans can determine,” he said. Wharton denied government claims that civil society organisations in Zimbabwe are fronts of the US government funded to facilitate the regime change agenda.